The Costa del Sol remains a favorite tourist destination for Spanish and European holidaymakers. Despite the continuing cases of corruption that have plagued Marbella and other towns on the Costa del Sol in recent years, the area remains a constant swarm of tourists year after year enjoying its beaches, its gastronomy and its exceptional environment. The forecast for this summer, despite the economic crisis, is pointing to high hotel occupancy levels compared with the previous year. The Costa del Sol tourism continues to maintain a faithful tourism and a high quality hotel supply. Malaga, Marbella, Benalmadena, Estepona and other coastal towns offer visitors first class tourist facilities with all comforts that today´s tourists demand. Undoubtedly, Marbella continues to be the tourist destination par excellence of the Costa del Sol despite the numerous corruption scandals that have occurred in recent times. The town retains its traditional luxury hotels with over twenty years in operation and constant renovation to meet all the needs and demands of tourists. In addition, have been added to the wide range of hotels in Marbella other newly established resorts with excellent designs and the latest technology. Following is a brief tour of the best hotels among more than twenty high-class hotels in the area of Marbella and Estepona. The Hotel Puente Romano is located in beachfront midway between Marbella and Puerto Banus. Its design is traditional with Andalusian reminiscences, lush tropical gardens, fountains, streams, waterfalls and palm trees offer guests a haven of peace and tranquility. This five-star luxury located just 11 kilometres from the centre of Marbella in Elviria area is a classic of the Costa del Sol. The Hotel Don Carlos has a tropical garden of 40,000 square meters surrounded by Mediterranean pine forests. In front of the beach below the hotel, is one of the best places to enjoy a cocktail listening to the best DJs of the moment: The exclusive Nikki Beach Marbella, a concept of VIP parties on the beach imported from Miami Beach, with personal service of sun beds, restaurant, massage etc. A few meters from Marbella city centre is located the Hotel Don Pepe, one of the most popular hotels in Marbella. The resort offers excellent spa treatments, 3 pools with Balinese sun beds and an excellent cuisine with in restaurants such as Calima, with two Michelin stars. Located in the famous Golf Valley of Marbella, the resort is an oasis of relaxation on the Costa del Sol a few minutes from the town of San Pedro de Alcantara. Sports enthusiasts can enjoy a golf course with 27 holes, a complete gym, or on the contrary, relax in the fabulous SPA. This luxury hotel, with nearly half a mile of secluded beach and spectacular ocean views is located in the town of Estepona. Opened in summer 2004, this hotel is becoming a benchmark of the Costa del Sol with its Thalasso Spa of over 1400 m2 and more than 50 exclusive health and beauty treatments. This neoclassical-style resort is considered one of the best in the world thanks to the personal attention, exceptional facilities and its location in the Flamingo’s Golf Resort, a perfect haven for golfers. Its stunning Thermae Spa is one of the best and most luxurious on the Costa del Sol. One of its most famous clients is the wife of U.S. President, Michelle Obama. They described five-star hotels are a few examples, among many others, of the luxurious hotel complexes provided on the Costa del Sol. Undoubtedly, this corner of southern Spain is one of the most attractive tourist destinations to enjoy a few days off as a couple, family or with friends. 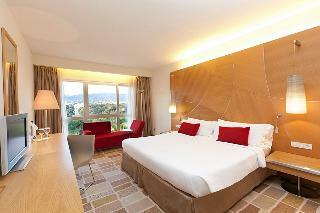 If you can afford a luxury hotel, why not checking for a luxury car hire in Malaga? This entry was posted on Wednesday, April 27th, 2011 at 8:20 am	and is filed under Hotels. You can follow any responses to this entry through the RSS 2.0 feed. You can leave a response, or trackback from your own site.